When it come to desset with milk i am not a huge fan, unless if it is fatty cream ;-) here hubby and S would love it though. They love milky desserts. Sounds lovely, will have to try... maybe for thxgiving :) Did you bring the KC Das from Kolkata or is it available in NJ? Irresistible dessert, tickling my sweet tooth..
Rasgulla looks divine. Very inviting.. I don't think I would call you lazy. I would call u smart. A would love this. I was never fond of payesh.I do not make roshogolla from scratch anymore. the canned ones work as good. Can I eat that whole pot please. I am just drooling all over it. Loving the virtual treat !!! That bowl of Rosogoolar Payesh is so delectable and alive. Just yesterday I was talking to my Mum in law and was telling her how my Mum would make Rasmalai with these store-bought Rosogollas. And nobody would know. It looks heavenly and it is not made from scratch works best for me. I lack the proverbial sweet tooth that all good bongs have but this rocks. Will be on this weekend for sure. Thanks. I've seen this with smaller rasgullas in the sweet store here, it doesn't look as thick or yellow - it's white and thin. The other day when I made semiya payasam it actually occurred to me to coat the semiya with ghee and MW it rather than pan-roast it - I was so proud of myself! I love sweet dishes specially rasgolla and sandesh..Your picture looks very inviting.. Came back to your blog after a really long time. I just adore rasgullas and when it comes to rasogollar payesh, I am a die hard fan :). 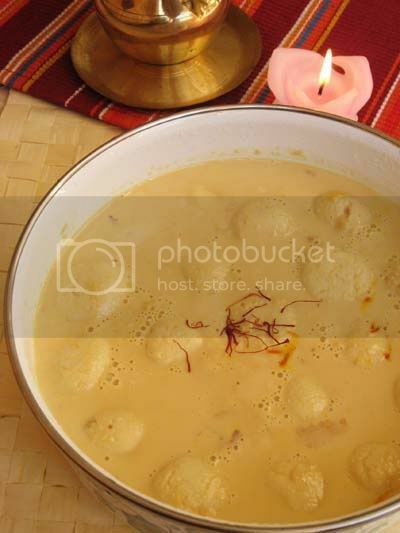 I prepared the rasgullar payesh sometime back and used the custard powder for an additional flavoring agent. Please do have a look at the preparation . Am not a ' making-from-scratch' person myself, and I totally love this! Bookmarked. You are very funny! I like the humour. And the recipe. I've made rasgullas from scratch,and rasmalai too, from fresh milk, in my far away youth. Now that I live in Kolkata, no point in even trying! here. Please mail me next time! Lots of love and hugs to you and your girls. I totally agree on your post. Sometimes the short cut is the best way to go. And even though there are times you want to do things from scratch , such recipes are saver for the times you just cant! Beautiful dessert! Its same as ras malai right? 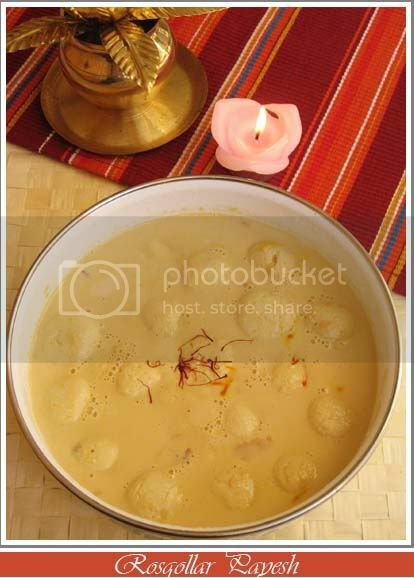 Hi Sandeepa, tried this rosogollar payesh sterday and enjoyed a lot, thanks for sharing,just blogged in my space, do have a look..
its almost like rasmalai:) looks divine! Wow..all ur dishes are great..i am keeping a food blog too..from ur recipes i tried the bread dahi vada and shukto..they turned out good..now i am dying to try sm desserts..check my blog too.. Most of your recipes (out of 5 or 6 that I tried) turned out well except the mutton curry which missed the flavour of robibarer mangshor jhol. The recipe seemed perfect but the timings most probably went wrong. Would you try to measure approx. 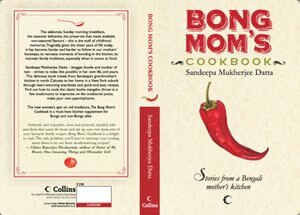 times with details like slow-medium or medium heat and provide some relief to some bong who is neither a mom nor a cook? About this particular recipe I would have almost sued you for copying me. As some post said you're smart certainly not lazy. I have so bookmarked this recipe, Sandeepa. Thanks for the link and the idea. I don't think I have used condensed milk, evaporated milk and whole milk in the same recipe, but I got a good idea reading yours!